Designed in 1956 and developed 1957-58, Twin Palms Estates was Coachella Valley’s first Alexander Construction Company subdivision. 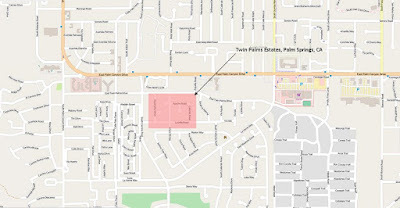 Originally dubbed Smoke Tree Valley Estates, Twin Palms Estates features a singular 1,600 square-foot floor plan with varying facades, rooflines and plan-rotation on approximate 10,000 square-foot lots, and each home came standard with two palms, hence the name change to Twin Palms.Homes were aimed at middle-income and second-home buyers looking for that escape from ordinary life. These homes embody the quintessential Palm Springs lifestyle – swimming pools, private yards, mountain views, and dramatic mid-century architecture. Probably the most iconic symbol of Twin Palms is the butterfly-roofline – a roofline that we see in several other Krisel housing tracts from the San Fernando Valley to Las Vegas. The homes are all post and beam construction, allowing for all interior walls to be non-load bearing. This, coupled with the in-slab HVAC ducting, allowed for a variety of open rooflines and unobstructed clerestory views. The Twin Palms models can also be found in the adjacent El Camino Estates and in the Vistas Las Palmas Estates neighborhoods, northwest of downtown Palm Springs.